With just over a week to go we take a look at the top 5 favourites for the Clare time trial championships. Taking place under Cycling Ireland affiliation for the first time in many years, we thank the bike to work scheme for providing the upturn in cycling fortunes and revival of what was in many eyes a sport for the brave and faithfully insane until recent times. Sean Mcilroy of Panda Carrick Wheelers an outside favourite for the vet’s category with maybe an eye for taking the scalps of a few of the younger heads Sean just can’t be overlooked. He will be challenged but he will challenge with every ounce of sweat he can produce on the night. Look for him on the vet podium. Cathal Russell if luck and wind is with him could also potentially podium if the mood suits him. Juniors we look to young MacDonald of Burren racing team to take the win and keep big daddy Gary happy J , Mark Shannon could also potentially challenge for the overall but once again the mercurial rider picks and chooses his events you just never know if and where the young carpenter will show up. 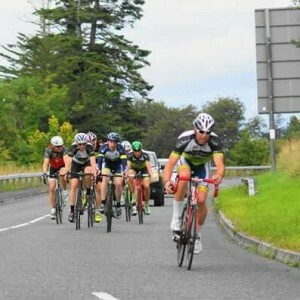 Damian Roche is another of the host club lads we will need to keep an eye on the cat 3 event. Returning to form this year after a small sabbatical he will surely look to capitalise on local knowledge. Stephen Gerraty the county champion in the road race is also one of the most improved riders in 2016; it would be a season to remember is he could take the County TT championship to go with his recent upgrade to a3 and his road race title. We have no doubt there will be a few surprises on the night of August 11th and we can’t wait to welcome you all to our course.